Livestream TV from M3U Local playlist or from your Internet service provider or free Playlist from any web source. Livestream TV - M3U Stream Player is a stylish IPTV / Media player setbox for Livestream TV from TV, tablets and smartphones. This application allows you to view IPTV technology based TV. 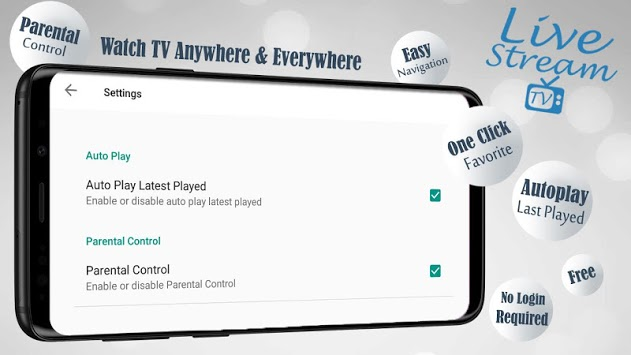 This application does not contain a built-in playlist, making it easy for you to watch TV online comfortably. Please use the playlist in m3u or xspf format. 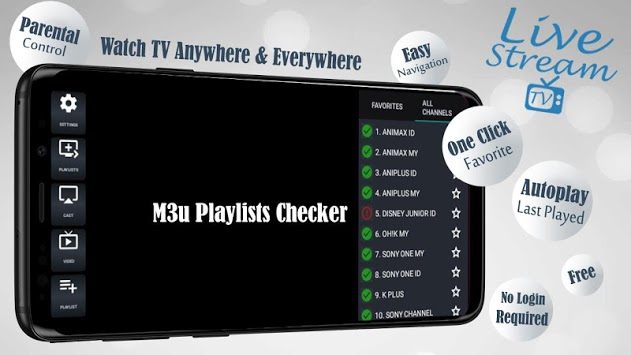 ✔ Automatically Check M3u Playlist Channels Connectivity. ✔ Local M3U Playlist support. ✔ Stream Playlists from any web source Example: github, pastebin etc. ✔ Playlist navigation is simple and easy. ✔ Automatically plays the last channel when opening the application. ✔ Easy parental control to hide some channels or playlists for kids. We do not offer all types of IPTV services such as IPTV subscriptions, streams. Users must have your own content, this is only a fast IPTV application that provides a platform for playing content. - Livestream TV has no affiliation with any third party providers. - We do not support streaming material that is copyrighted without the permission of the copyright holder.